Ever since the days of John Wesley (well actually since the time of Jesus… He lead a “small group” of 12…), small groups have been an essential part of the life in the church. Yes, we meet on Sundays for worship, but it’s in those smaller conversations where we experience the support that helps us grow closer to Christ. PUMC has always plugged into the power of Small Groups. “Small Groups” come in a variety of sizes, ages and interests, but they all work to bring us closer to Christ by applying God’s Word to our lives. We currently have several Small Group Bible studies for a variety of ages; anywhere from pre-school through seniors. Some of them meet during the Sunday School hour, but many meet during the week. Some meet in the church building, others meet in homes. 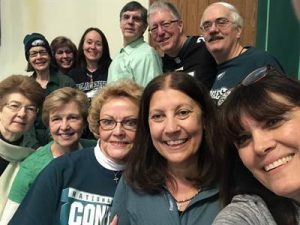 Last year, one group traveled to a different restaurant in Philadelphia once a week to sample a variety of dining experiences (while sharing some Biblically Based after meal discussions). This year, there’s a group that meets in a woodshop to learn carpentry skills, while learning more about The Carpenter (Jesus). Other groups sing, one group knits. The day by day tabs shown below summarize each day’s small group opportunities. Click through each tab and see if there’s a group you’d like to plug into. For more information on our Small Groups, contact Carol Fox or Kristen Russell. If you’re interested in joining one of the groups, contact the leader, or visit the “Small Group Signup” desk in the Narthex after church, or contact the office, or…. just show up! Showing up is more important than Signing up! This adult class will continue its study of the Bible and Christian principles and how to apply them to everyday life. Starting in September we’ll study the book of Hosea. We’ll then move on to the book of Daniel. BLAST is our youth group where we have a BLAST playing games, diving into God’s Word, and hanging out with each other as the Body of Christ. This is for youth in grades 6 to 12. 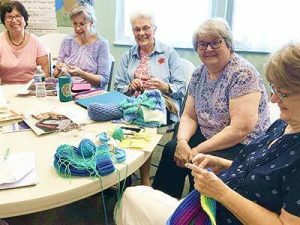 Come knit, crochet, or just fellowship with this group. We also listen to – and learn about – our favorite hymns & Christian songs. Find out how God inspired the composers and how we can apply their inspiration to our own lives. Some of our projects will be donated to the Christmas Marketplace in November, but most are given to various charitable organizations which are supporting members/friends who are ill. For more info on our “Thread ‘n Yarn Ministries”, click here. We’re currently looking at the book of Hebrews. We’ll then move on to read and study one of the letters from the apostle Paul . This study is targeted for the people who drop off the children who attend Our Father’s House Preschool, but all are welcome. Pastor Jim leads with a time of reflection on the past Sunday’s service and then we pray for the church and each other. He then leads us on a series of studies (either topical or directly from scripture). Pastor Jim leads us on a series of studies (either topical or directly from scripture). The study is a repeat of the morning’s session. The title is yet to be announced, but we will read a book and then share our reactions and discuss how we can apply this book to our lives. This is a class intended for children ages 4 to grade 5. Lessons will focus are bringing the children into a relationship with God. Our Youth Group, BLAST (Big Loud Awesome Spiritual Time) meets on Tuesday nights for a Bible Study. Topics vary from week to week. 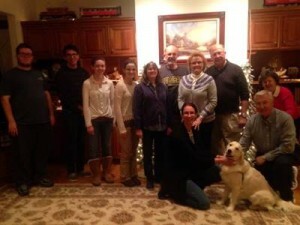 This is in addition to the “regular” BLAST activities that occur on Sunday evenings. Helen is gathering people together to make Christmas tree ornaments to be sold at the Christmas Marketplace. Come help us spread Christmas joy to the helpers who make them and the buyers who will enjoy them. This group will be finishing the wooden signs/plaques and putting the finishing touches to many items to be sold at the Christmas Marketplace. Come join the group to help make a difference. This group will explore hymns adapted into today’s contemporary music style. We’ll listen to these songs and dig into the origins behind the words. Come be a part of this group that wants to help those who could benefit from good Christian craftsmanship. Some of these projects will be donated to the Christmas Marketplace in November. Skill levels may range from beginners to master craftsmen. Join the choir. It’s never too late to make a joyful noise unto the Lord! A short discussion connects the music for the coming worship service to the coming week’s sermon. Currently, no groups are meeting on Friday… but stay tuned! 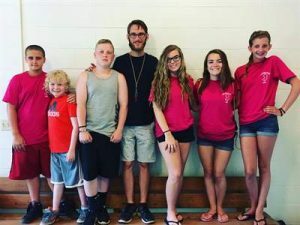 The NOT-YET-READY-FOR-PRIME-TIME SINGERS is a ministry that usually begins with dinner (at someone’s home), and then goes out to visit shut-ins and nursing home residents. Dinner (when we have it) is at 5:15. Afterwards we leave to sing at 6:30. Ostensibly, the purpose of the visits is to sing “to” our hosts, but we always find that our visits “with” our hosts leave us all enriched.